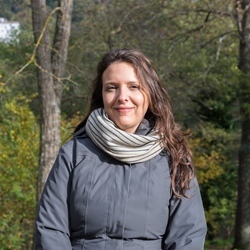 Luciana Squadrilli introduces twelve of Italy’s most beloved traditional desserts, each one representative of a certain region’s local cuisine. We all love gelato – the lighter and tastier Italian craft version of ice cream, made with natural and fresh ingredients – but Italy has got much more to offer those with a sweet tooth. From rich cakes to small bites, from the creamy and energetic tiramisù to the indulgent cannoli siciliani, here’s a selection of the country’s most appreciated desserts. 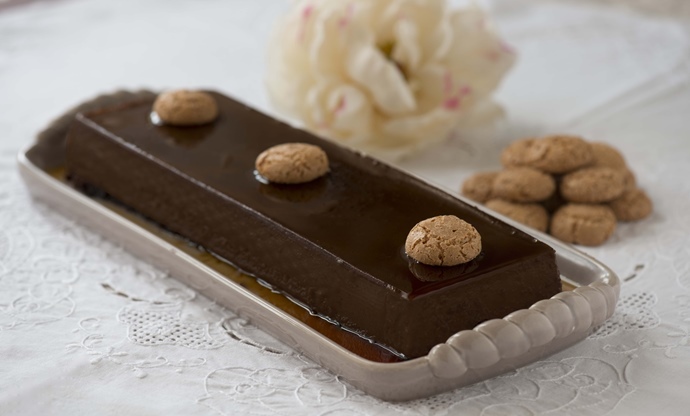 Probably the most famous of all Italian desserts, Tiramisù is a powerful layering of coffee-soaked savoiardi (sponge finger biscuits) and a rich cream made with mascarpone cheese, eggs and sugar, sometimes spiced up with a drop of liqueur. 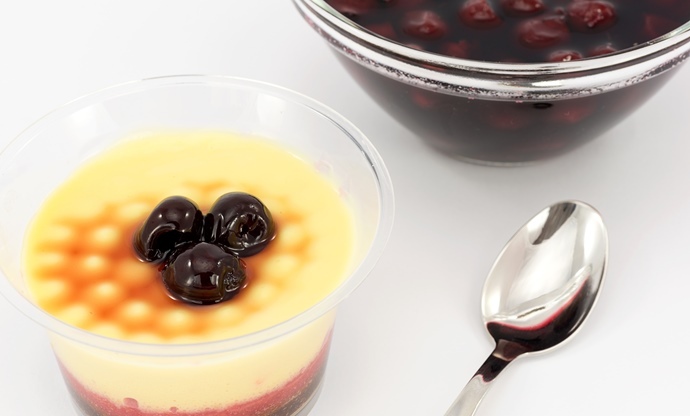 The result should be a smooth and soft dessert to be eaten with a spoon, usually served in a glass or cup. 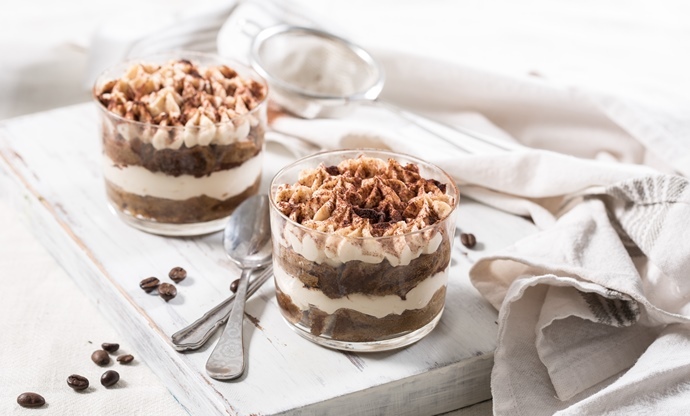 Today tiramisù is very common in the whole country and it’s easy to find it on the menu of many restaurants, yet its origins are definitely from the north of Italy; Veneto and Friuli-Venezia Giulia long and fiercely crusaded to claim it as their own. According to some, it was first found on the menu of a restaurant in Treviso in 1971, even though the habit to serve it as a ‘tonic’ to the customers of local brothels would have dated back to the 1930s. Others believe it was first served in the 1960s by a mountain restaurant in Friuli, as an opulent ‘final bite’. Eggs, sugar, milk, cocoa, spirit (originally the local Fernet, a digestive bitter herbal liqueur, but today usually rum or Cognac), amaretto biscuits and sometimes hazelnuts are the ingredients of this typical, custard-like dessert from Piedmont. Its name relates to the ‘curvy hat’ shape given by the traditional, truncated conical copper mould used to cook the dessert in a bain-marie. Served cold, it’s simply delicious. The funny name of this simple yet irresistible cake means ‘crumbly’ and refers to its extreme flakiness. Originally from Mantua, the town once ruled by the Gonzaga family in the seventeenth century, it was a humble recipe made of common local ingredients: corn flour, coarsely chopped hazelnuts and lard. Today, it’s usually made with a mix of corn and white flour, almonds and a generous amount of butter. It’s then enriched with sugar, eggs and lemon zest – resulting in its iconic uneven texture. Sbrisolona should be eaten by breaking it into pieces by hand and paired with either grappa or the lovely Vin Santo (a sweet wine). This lavish ‘black cake’ (as it was originally called before being officially named after the famous local architect Jacopo Barozzi in 1907) is made of almonds, peanuts, coffee and dark chocolate. It was created in the small village of Vignola, near Modena, at the end of the nineteenth century by the talented pastry chef Eugenio Gollini. 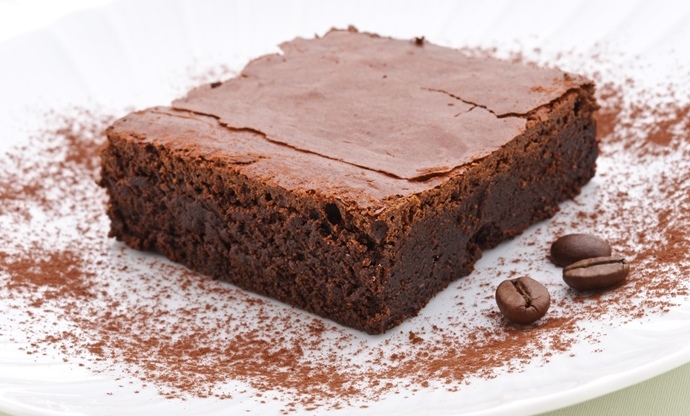 His namesake uncle, the owner of the Gollini bakery (which still exists in Vignola today) trademarked its name and decided to keep the recipe secret, turning the dish into a legend and helping it become one of the region’s most famous culinary creations. 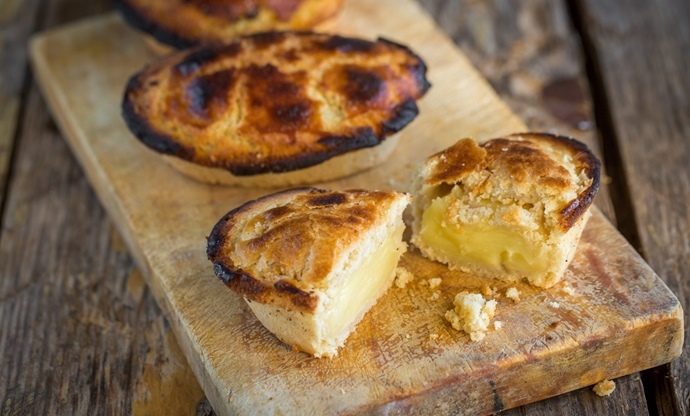 A curious hybrid of a tart and a custard, these sweet bites are usually eaten in Tuscany for breakfast or as a tasty snack. A small, boat-shaped shell of shortcrust pastry is filled with a creamy rice pudding flavoured with lemon zest and sometimes Sambuca (anise-flavoured liqueur), then baked. There’s also the somewhat similar torta di riso from Emilia-Romagna (shown above), which is served as a cake without the pastry. 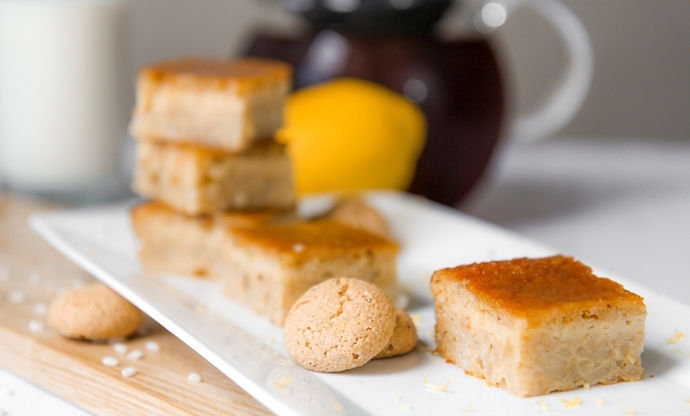 How is it that one of the most traditional Italian homely desserts – widespread in all the central regions of the country (yet hard to find on restaurant menus these days) – is named after England? Nobody knows for sure as its origins are uncertain, even though it’s mentioned in the famous cookbook by Pellegrino Artusi, Science in the Kitchen and the Art of Eating Well, published in 1891. Was it an attempt to recreate an English trifle after a request by the Dukes of Este, the family ruling Ferrara? Perhaps. The recipe, however, is well-known: several layers of sponge cake or savoiardi are dipped in a bowl filled with Alchermes (a red-pinkish herbal liqueur), crema pasticciera (a thick, lemon-scented egg custard) and sometimes chocolate cream or a fruit compote. It is usually served in a transparent bowl to display the colourful layers and sometimes comes topped with crunchy almonds, chocolate chips or small meringues. 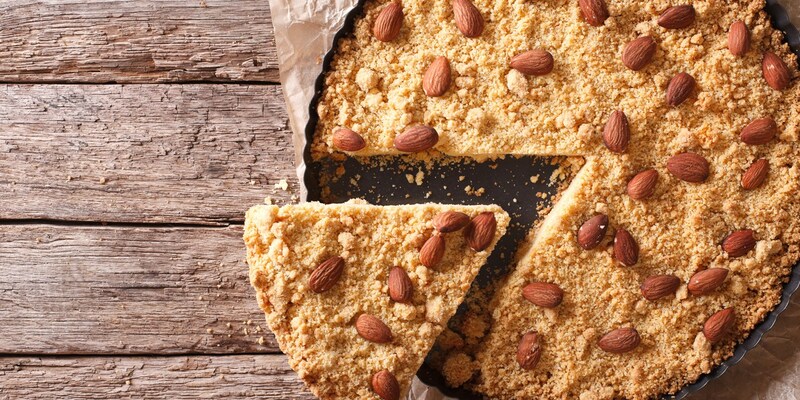 A typical recipe of the Roman Jewishtradition, this tart is as simple as it is scrumptious. Its origin dates back to the eighteenth century, when a papal decree forbid Jewish people to sell dairy products to Christians. They thus decided to ‘hide’ ricotta cheese between two layers of pastry and sour black cherries. Today, in the pastry shops in the Jewish quarter of Rome (as well as in many other areas of the city and in almost every Roman trattoria), one can find different versions of the original recipe.It could come as a pie fully covered with shortcrust pastry or a simple ricotta tart topped with a generous amount of sour cherries (fresh or in jam). The contrast between the sweetness of the cheese and the sour taste of the fruit never fails to delight the palate. This tall, soft and airy version of a sponge cake, either baked in the traditional ring-shaped mould or in an individual portion with its peculiar mushroom shape and soaked with syrup or rum, brings the art of rising to the extreme. Despite its Polish origins (babka ponczowa was the name of a cake created by Stanislaus Leszczyński, the exiled king of Poland who decided to soften the dough of a typical Alsatian cake with alcohol), babà is commonly considered a symbol of Neapolitan culinary and cultural heritage. Saying to someone you love ‘you are a babà’ means they’re very sweet and kind. Naples might be famous for being the birthplace of pizza, but it has a long history of creating incredible confectionery. 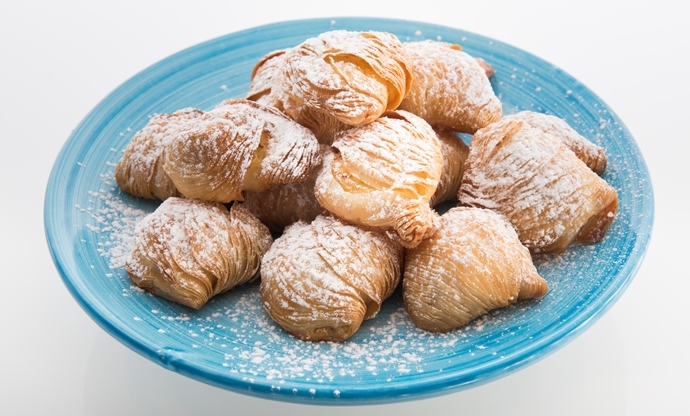 Among its many traditional sweet recipes, sfogliatelle deserves a place of honour. A crisp, multi-layered and crinkled shell of thin puff pastry – sometimes replaced by a softer and smooth shortcrust casing in modern versions – is shaped like a lobster tail and filled with a luscious mix of ricotta cheese, semolina, sugar, eggs and candied citrus. The archetypal recipe – called Santarosa in honour of the eponymous monastery near Salerno where it was born – was created by a nun, who invented a way to use up leftover semolina. What a blessing. 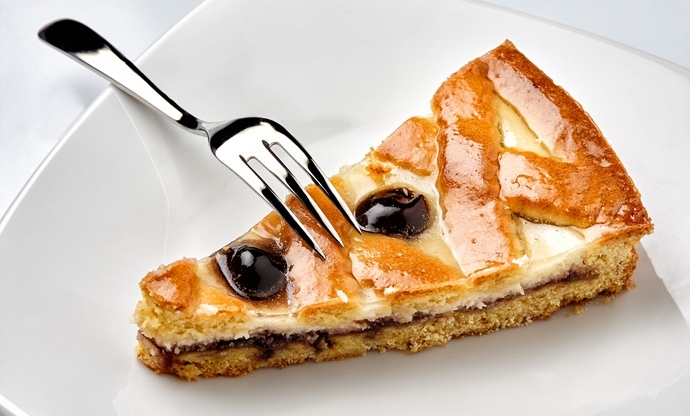 A crumbly oval crust – originally made with lard, now often replaced by butter –holds a scrumptious filling made of crema pasticciera (egg custard) and sometimes preserved sour cherries. 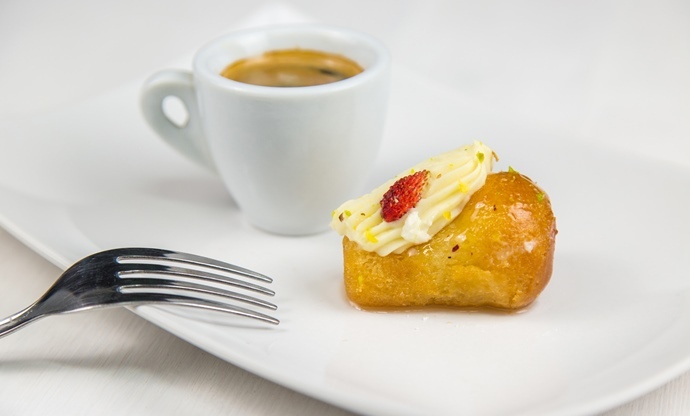 Similar to other traditional Italian sweets, this Puglian recipe – created by a local pastry chef in 1745 and typical of the Salento area, specifically around the beautiful town of Lecce – is very famous. Once you experience the bliss of eating a warm pasticciotto, just out of the oven for breakfast, you will crave it for the rest of your life! 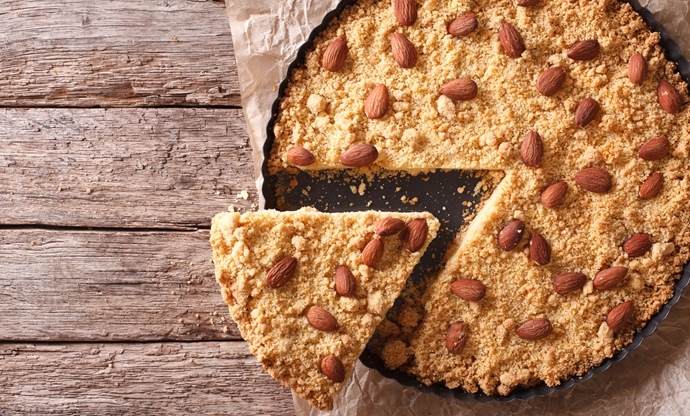 Cheese and honey are the key ingredients of this typical Sardinian treat, which was originally served as a main course given its rich and filling nature. A round puff pastry shell (made with durum wheat, water and lard) is filled with fresh cow or ewe cheese before being sealed, deep-fried and covered with sugar or honey. 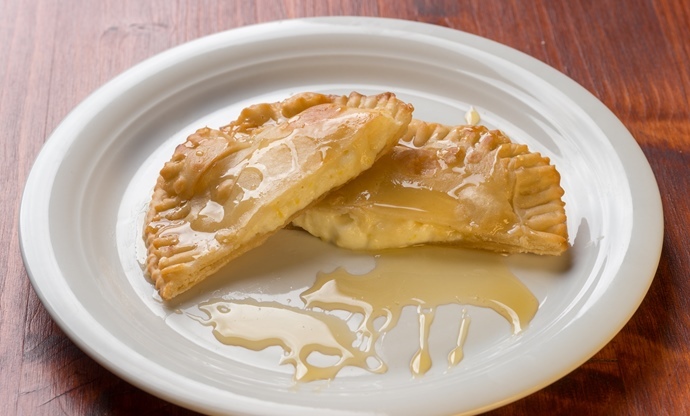 Seadas should be eaten piping hot, when the cheese is still melting and mixed with the sweet honey, creating a lovely contrast. 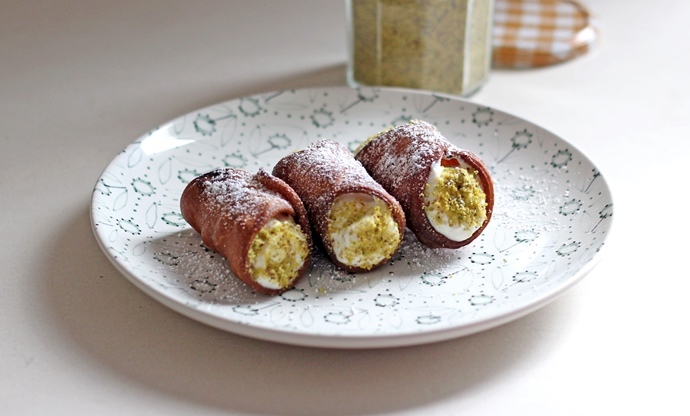 An ancient, traditional recipe originally baked for Carnival and now eaten all year in every corner of the beautiful island of Sicily, the famous cannoli – taking its name from the fact that a river cane was originally used to shape the dough – mixes Arab influences, conventional culinary traditions and local ingredients such as ricotta, honey (now replaced by sugar) and candied citrus. The scorza (‘rind’, a thin, tube-shaped shell of fried dough) is filled with a creamy mix of ricotta and sugar which – depending on the area of the region and on personal preferences – can also be mixed with chocolate cream or chocolate chips, then decorated with candied fruits, chopped almonds or pistachios. The secret to the perfect cannolo? It should be filled right before serving, to stop the scorza getting soggy.